Multiple choices for Above Ground and Inground Pools. Scroll down to browse through information on salt chlorine generators, for above ground and inground pools. You'll be able to choose from a variety of options, to help you maintain your water, with less work and better results. The Website Store Directory contains an alphabetized listing of all products for sale. We don't just sell products. We help you make a better-informed choice, by providing all the information, you might require. Need ordering help? Scroll down the page, for the Order Desk Telephone Help Number. All items ordered will end up in the same shopping cart, no matter which page of this website, the items are located. All Major Credit Cards and PayPal are accepted. Order one today. In-Line Models require some plumbing and electrical installation. Drape-Over Models installation require NO Installation. Simply Plug-n-Play. In-Line salt chlorine generators, three models, for pools up to 20,000, 25,000 or 40,000 gallons. No installation Model SR, for all types of Pools, up to 20,000 gallons. Complete system. Drape-Over. 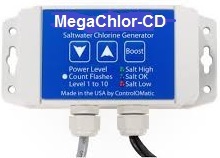 MegaChlor-CD with Chlorine Detection Technology. Never over chlorinate again, with this automation. 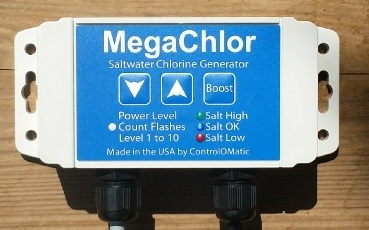 MegaChlor Salt Chlorinator, for pools up to 17.000 gallons. No Chlorine Detection capability, but includes great features. For Spa, Swim Spa and Hot Tub Models, please click here. Shop with complete, on-line safety and security. Scroll down to view product specifics and to place an order. The advantage of the Reliant Salt Chlorine Generators simplicity of design and its easy of use. Utilizing the fewest, practical number of switching parts and uncompromising electrical protections, all Reliant models are designed to resist the inevitable power surges and harsh outdoor conditions. The Reliant Systems are easy understand and to operate and will provide years of trouble free service. Reliant Salt Chlorine Generators are available in 3 models, for all types of pools up to 20,000, 25,000 or 40,000 gallons, and are designed to be installed inline, with the filtration system. It is typically installed last in line, after the pool filter and heater. Proper operation requires that the salt chlorine generator be powered, by the same electrical source, that controls the filter operations. An electrical feed cable and flow-detection switch are provided to reduce installation time and to assure proper performance. 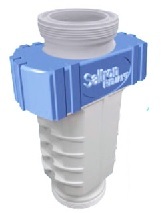 Install the salt cell inline, using quick disconnect fittings, to facilitate its removal for inspection, cleaning, replacement or winterizing. Pounds/Grams per 24 Hours 0.93 lbs. Reliant system produce, chlorine in its elemental form, by electrolysis of the salt previously added to the pool water. After the salt is converted to the active sanitizing form of chlorine and any bacteria and algae have been destroyed, the spent chlorine recycles back to salt and this process keeps repeating. The salt concentration is very low (about the same as a human tear) and the water feels softer, smells better and is less irritating. Salt additions basically are a one-time task, other than replacing that lost through pump out, backwashing or leakage. Salt chlorine generators are the better way to do chlorine. No measuring, handling or storage of chlorine products. • Proven to be efficient and affordable. 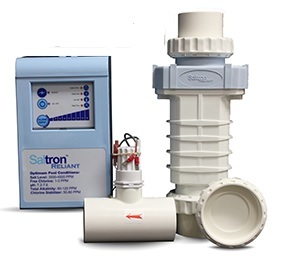 • Reliant Salt Water Generators utilize advanced electronic technology. • Designed for in-line installation and includes connectors. • Robust cell construction withstands pressures up to 100 PSI. • The power supply features adaptable connections to suit any type of installation. Protected against UV damage, from Sunlight. • Operates efficiently at salinity levels of 2000-6000 PPM. Twenty five pounds, per 1000 gallons works in most cases. • Operates on 110 Volts or 220 Volts. • Boost Mode allows for superchlorination. • Features LED icons for ease of use and proprietary circuitry for maximum efficiency. • Utilizes commercial grade titanium cell plates, coated with precious metals, for better performance and extended life. • The Reliant systems includes all relevant safety or performance features. • Variable chlorine production, for optimal control of the chlorine level. • Three models for all types of residential pools. • Model CLG220A: treats above ground pools up to 20,000 Gallons (76,000 liters). • Model CLG225A: treats all types of pools up to 25,000 Gallons (95,000 liters). • Model CLG240A: treats all types of pools up to 40,000 Gallons (152,000 liters). • Replacement salt cells are available. • Transferrable, limited 3-year factory warranty. • Includes complete, easy-to-follow installation/instruction manual. • Shipping size: 18" x 17" x 8". Shipping weight: 16-pounds. This is simply the better way to do chlorine!!! and 3-ways to test salt and water chemistry. ● Add the appropriate amount of salt to the pool. ● Assemble the unit's bracket, and place on the pool's top rail or coping. ● Place in the vicinity of a return jet, if possible, to help dispense the chlorine. ● Plug into a GFI protected 110 volt AC outlet. ● Turn the controller on, set digital timer and that's it - you're generating chlorine. ● Even includes a package of salt test strips. ● This is the better way to do chlorine!!! ● Includes everything you need, except for the salt. Simple to set up! The Model SR salt chlorine generator is suitable for all types of pools, up to 20,000 gallons. Includes mounting brackets for inground pools and above ground pool with flat or circulator top rails. Salt test strips arte included, to help you start on the right foot. Includes everything you need, except for the salt. The Model SR Salt Chlorine Generator is a self-contained purification system, that utilizes a natural process to generate pure chlorine. The electrolytic process uses a very low concentration of salt, 2500 PPM, which is less than a teaspoon per gallon. It generates free chlorine and helps destroy the irritating and odorous forms of chlorine. The chlorine continuously kills bacteria and algae and then reverts back to salt. This indefinite cycle leaves the water feeling silky, soft, refreshing and sparkling clear! The Model SR Salt Chlorine Generator is easy to install, economical-to-use, and fully automatic. Water containing salt enters the chlorinator, through the openings on the sides. Chlorine is carried out through the top openings. For best distribution of the chlorine, install the unit near a return line. 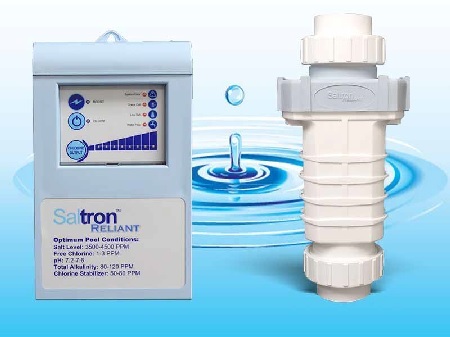 Maintaining an optimum chlorine level has never been easier! ● For use in all types of pools, as large as 20,000 gallons. ● Installs in above ground pools with flat or round top rail construction. ● The adaptor (included) allows it to be used in an inground pool. ● Not suitable for soft sided pools, with top air rings. ● Includes a package of salt test strips and everything, but the salt. 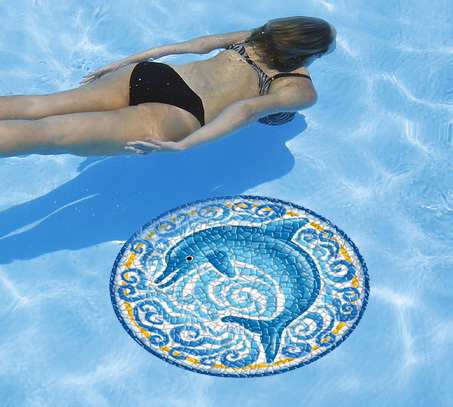 ● Easy installation on new and existing pools - no plumbing required. ● Helps keep a consistent Free Chlorine residual. ● Reverse polarity keeps cell clean and prevents scaling. ● Clear cell housing allows user to easily inspect cell for scaling. ● Switch-mode power supply supplies smooth current to cell, resulting in longer lifetime. ● No more purchasing, transportation or storage of chlorine. ● No more skin irritations and itchy red eyes. ● No more faded bathing suits. ● Critical fault protections with automatic shut-down. ● No more harsh chemicals in your swimming pool. ● Programmable digital timer to adjust chlorine output. ● LED indicator lights illuminate for easy salt level reference. ● Commercial grade titanium cell plates coated with precious metals, for years of service. ● Replacement salt cells are available and easily installed. ● Expected cell life is 5,000 hours hours, when used as recommended. ● Input: 115 VAC, 1.5 Amps or 230 VAC, 0.75 Amps. Auto-detects the voltage. ● Optional Electrical adaptor plug, 220 VAC, for use in European countries. ● Chlorine Production: 0.4 pounds per day or 8 grams per hour. ● Chlorinator Dimensions: 12" x 9" or 30 cm. x 23 cm. ● One year factory warranty. Shipping Size: 25" x 13" x 7"
If you plan on using this with a 220 VAC power source, such as used in Europe, an adapter is available that coverts the 110 VAC style plug to a European style 220 VAC plug. 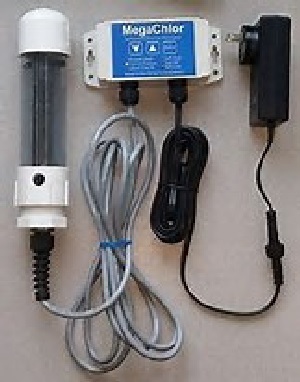 This model salt chlorine generator auto-detects, whether the voltage is 110 V or 220 V.
** International and orders outside of Continental U.S. - see comments below. Shipping is FREE, within The Continental U.S. (48 states). The MegaChlor Models are High-Output, Drape-Over salt chorine generators, for use in all types of Pools, up to 17,000 gallons, as well as smaller Swim-Spas and Spas. The MegaChlor-CD Model includes Chlorine Detection Technology, that turns the unit on and off, based on the actual chlorine content, so that you never over-chlorinate again. There is no installation required. Add the recommended amount of salt, connect the salt cell to the power supply and Drape-Over the side. Set the controller and you're making chlorine. The standard MegaChlor Model does not include the Chlorine Detection Technology, found in the MegaChlor-CD Model. These units are a better way to do chlorine! The standard MegaChlor Model does not include the Chlorine Detection Technology, found in the MegaChlor-CD Model. Otherwise, their performance is the same, with the only obvious appearance difference being the color of the salt-cell cable. Using chlorine has never been easier or better! ● Treats all types of Spas, up to 3,000 gallons. ● Treats all types of Swim Spas, up to 10,000 gallons. ● Treats all types of Pools, up to 17,000 gallons. 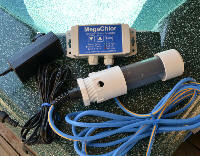 ● The MegaChlor-CD Model is SMART enough to know when to produce more chlorine and when to shut itself off. ● With a MegaChlor-CD Model, you will never over-chlorinate again. ● The MegaChlor-CD features Chlorine Detection Technology and the Automatic On/Off operation is based on actual chlorine content. ● Plug-n-Play Operation, with push button controls. ● The only obvious difference, between these to units, is the color of the cable on the salt cell. The MegaChlor cable is gray and the MegaChlor-CD cable is blue. The Controller Unit is the same. Upgrade the salt-cell and you upgrade the unit. ● Higher-Output, Extra Large Salt Cell generates more chlorine, to accommodate the needs of all types of Pools, up to 17,000 gallons, Swim Spas up to 5,000 gallons and Spas up to 3,000 gallons. ● Includes everything required for Drape-Over operation: Extra Large salt cell, Controller and all required connections. ● Packages of salt Test Strips and 4-way Test Strips are included. ● Eliminates the needs to add other forms of chlorine. ● Auto detecting 110/220 VAC switching power supply. ● Up to 100 grams of chlorine production (220 grams of bromine), per day. ● Low 5 volt dc output. Certified to CUL and UL Low operating costs. ● Simple press of a button, changes the power level. ● No external Timers Required. Around the clock operation. ● Produces controllable amounts of chlorine, in 3-hour cycles. ● Clear cell compartment allows for easy inspection of the salt-cell plates. ● Built-in salt level indicator. RED= Low Salt, BLUE= SALT OK, GREEN= Salt High. ● Self Cleaning technology. Plates are removable for cleaning. if necessary. ● Salt-Cell life is an expected 7,000 hours of chlorine production. ● Three Larger (3) Titanium plates coated with Ruthenium Oxide for 7500 hours of operation. ● Easy to replace salt-cell. ● Low 3000-4000 PPM NaCl salt concentration for chlorine, or 6000-8000 PPM NaBr for bromine. ● Simple Plug and play installation, no spa modification required. for Spas, Hot Tubs, Swim Spas up to 5,000 gallons and Pools up to 17,000 gallons. Need something to test the salt level? See below!!! The Safe-Dip 6-in-1 Digital Water Chemistry Tester is a hand-held, meter, designed to measure several important pool and spa chemistry test factors. It can test for Salt, TDS (Total Dissolved Solids), Free Chlorine, pH, ORP (Oxidation-Reduction Potential) and Temperature. 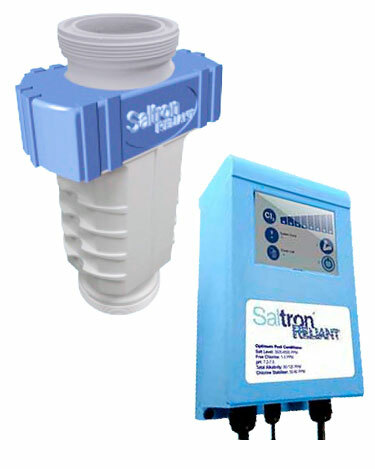 The ability to test for salt makes this an ideal tester, for use with salt chlorine generators. 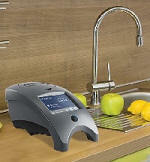 The TDS test helps manage extreme hard water problems. The ORP test measures the true effectiveness of chlorine, at the current chemistry of your water, telling how well the pool or spa is being sanitized. The TDS and ORP can only be performed, by using this type of water testing technology. 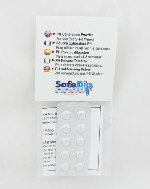 The Safe Dip Tester is all-digital and is easy to use. Simply remove and fill the built-in sampling cup with pool or spa water, remove the black rubber sensor protector, insert the tester in the sampling cup and press the start button, In just a few minutes, you'll have a complete set 6 test readings. It evens stores the previous test results, so that you can make a comparison and monitor trends. ● The pH 7.0 Buffer Tablets are not normally included, with the initial purchase of the tester, and need to be ordered separately. However, we do supply a free, complimentary package, for all our buyers. ● Use every 4-8 weeks, for best pH test reliability. Order the 6-in-1 Tester and a package of Buffer Tablets will be included, at no charge. This waterproof test meter measures salt, TDS and temperature. 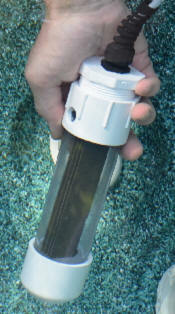 The tester’s probe is dipped into a sample of pool water and the results are ready instantly. 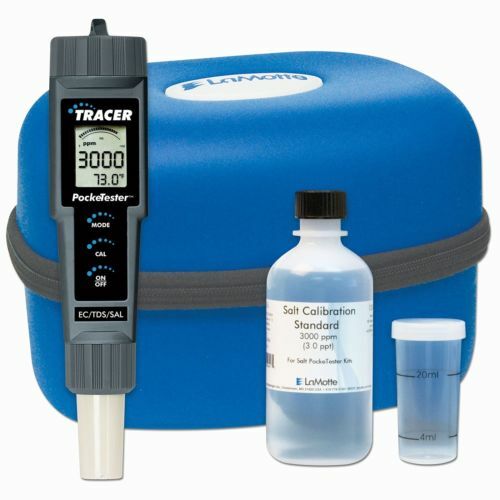 This PockeTester measures the Sodium Chloride level in salt water pools, within a range of 0 to 9,999 ppm. TDS is measured from 0 to 9,999 ppm and Temperature from 32.0 to 149°F. Changing the sensor probe, allows a different test to be performed. Item No. 1749-KIT includes the meter, a 120 ml. calibration standard and a carrying case. Stores the last 15 test results, in its memory. Sensors are replaceable. ● Suitable for use by professionals or pool/spa owners. ● Digitally Tests for Salt, TDS and Temperature. ● PockeTester has a 1-year Factory Warranty. Tests for Salt, TDS. Temperature, Free Chlorine, Total Chlorine, Bromine, pH, Alkalinity, Calcium Hardness, Cyanuric Acid and Phosphates. If your pool or spa uses a salt chlorine generator, this Professional-Grade Test Kit, provides all the testing, that you should require. The #1749-PRO-01 Tracer PockeTester digitally measures salt and TDS levels, from 0-9,999 PPM and Temperature from 32-149°F. The Insta-Test PRO 600 Test Strips, contain 100 strips and tests for Free Chlorine (0-10 PPM), Total Chlorine (0-10 PPM), Bromine (0-20 PPM), Alkalinity (0-240 PPM), pH (6.2-9.0), Total Hardness (0-800 PPM) and Cyanuric Acid (0-250 PPM). The Insta-Test PRO Phosphate Test Strips contain 50 strips and measure phosphates, in the range of 0-25000 PPM. Includes a convenient carrying case and a salt calibration standard. Professional-Grade, but easy enough for home pool or spa use. ● All test strips are LaMotte Insta-Test PRO Grade. ● Test strips provide instant readings. ● All the testing you need, for a salt chlorinated pool or spa. The Circulator helps eliminate dead zones, which promote pool algae growth. These NEW Test strips test over an expanded range of 0-500 PPM. Drop onto the pool floor. Weighted to remain in place. 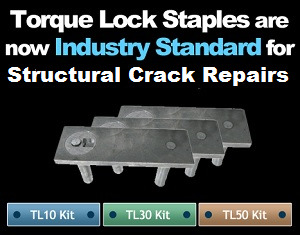 Torque-Lock Staples The better way to make a Rock-Solid concrete crack repair.